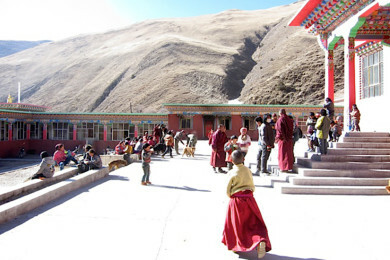 Surmang was the monastic seat of Pema’s principle teacher, Chögyam Trungpa Rinpoche, until the Chinese invasion in 1957. When Trungpa Rinpoche’s son, Sakyong Mipham Rinpoche, visited Surmang in 2003, the villagers let him know that their greatest desire was for a college to be built that would serve the monastic and lay community. Pema and The Pema Chödrön Foundation are committed to help bring the building of the college to completion by the end of 2015. When completed, the college will profoundly benefit the monks and nuns, but will also serve the spiritual and cultural needs of the local community, which is so central to their traditional way of life. When completed, the college will be under the guidance of the 12th Trungpa Tulku, Chokyi Senge Rinpoche, the reincarnation of Chögyam Trungpa Rinpoche.